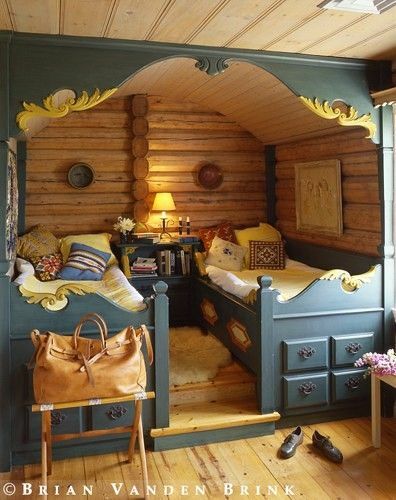 Having two kids who grew up like twins I always plan to have their beds like the picture above which is like cottage beds seen on most fairy tale stories. My two daughters has only more than a year difference in age and because of this they were mistaken always as twins when they're just babies and toddlers. They're not identical nor similar in features but they really look like twins because they like many things in common and I dressed them in sHimilar dresses with different colors of their preferences. Just remembering their childhood days makes me smile because now that they're teens already they still look like they're of the same age, different in looks but same in some ways. How I love my darling daughters but I think this fairytale beds will not be appropriate for them anymore. Well for those of you who have two darling kids who grew up almost the same as my girls or who have two little boys this would be perfect. Well on second thoughts it could be patterned for bigger beds also.